The Tamil National Alliance (TNA) complained to President Maithripala Sirisena that despite nine years having passed since the war ended, the armed forces continue to occupy agricultural and residential lands. The TNA made this observation at a meeting of the Presidential Task Force on the Development of the North and East yesterday (27th) at the Presidential Secretariat. Several ministers, government MPs and all TNA parliamentarians attended the meeting which was presided over by Sirisena. 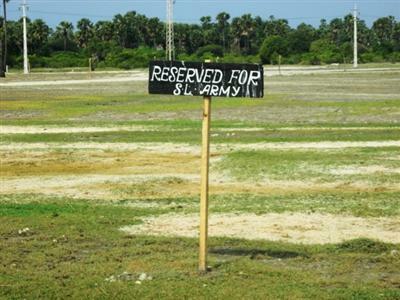 The TNA, responding to the President’s claim that 88% of the land held by the Army when his government assumed office had already been released, pointed out that 75 acres of private land in Keppapilavu, Mullaitivu, was still held by the Army and discussions with the President and high ranking Army officials had not met with any success. The TNA delegation also claimed that people were ‘greatly harassed by the actions of the Forest Department, Wildlife Department and the Archeological Department’. According to a media statement released by the party, ‘the Forest Department and the Wildlife Department are planting boundary stones and taking possession of lands that had been abandoned by people during the war and which had thereafter gone to jungle’. They called for a meeting attended by the heads of the above three departments, the Land Commissioner, and the Government Agents of the districts in the North and East to address this issue and resolve the aforesaid problems of the people. The Meeting of the Presidential Task Force on the Development of the North and East took place yesterday (27.08.2018) at the Presidential Secretariat. The meeting was presided over by His Excellency the President. Several ministers and government members of Parliament and Government Officials participated at the meeting. All the Tamil National Alliance (TNA) Members of Parliament headed by Hon R Sampanthan the Leader of the Opposition and the Tamil National Alliance, including Hon Mavai Senathirajah Leader of the ITAK, Hon Selvam Adaikkalanathan Leader of the TELO and Hon Tharmaligham Siddarthan Leader of the PLOTE and all other district Parliamentarians other than Hon M.A. Sumanthiran Jaffna District, and Hon. Sivashakthi Ananthan Vanni District were present. Mr. Sumanthiran is out of the country. But the fact remains even 9 years after the conclusion of the war both agricultural land and residential land lands yet continue to be in the possession of the armed forces. One glaring instance was Keppapilavu in Mullaitivu district. Where 75 acres of private land owned and possessed by local people for generations and centuries was yet held by the army. This mater has been discussed with both the President and army high-up’s several times. A serious situation pertaining to land prevails in the Mullaitivu District. A new system described as system “L” was proclaimed under the Mahaweli Act in the 1980s, even before any water from the mahaweli came to that area. This was where a settlement known as “Welioya” or “Manalaaru” was created in that area comprising of persons from other districts of the country. Consequent to protests the programme was in suspension for some time. During the term of the previous government some further settlement of persons from outside took place in this area. There are numerous complains that the programme is thought to be renewed now and that there is a proposal to settle persons from outside of Mullaitivu in these lands. Mr. Sampanthan stated that this should not be allowed. If water was brought to Mullaitivu from outside land in Mullaitivu without irrigation facilities should receive irrigation facilities and the people who own and cultivate the lands should be the beneficiaries. Landless people in Mullaitivu entitled to receive state lands must be also be beneficiaries under such a program. The President immediately contacted some authority by telephone and gave the assurance that no such program would be implemented and that he himself would visit the area with the TNA members of Parliament and ascertain the correct position. Mr Sampanthna also refer to the discrimination against Tamil youth in employment in the public sector. He said that Sinhalese ministers were looking after the Sinhalese youth and Muslim ministers were looking after Muslim youth only negligible number of Tamil youth receives employment through some ministries and grave injustice is being perpetrated on Tamil youth both males and females. Such action will not lead to reconciliation or national integration. It is necessary to address this issue as an urgent issue. Mr Sampanthan stated that since the enactment of the 13th amendment to the Constitution much work has been done by successive Governments and presidents to formulate an acceptable solution. During President Premadas’s time there was the Mangala Munasinghe select committee proposal, during president Chandrika Bandaranayaka Kumarathungaka’s time there was the August 2000 proposal, during President Mahinda Rajapaksha’s time there was the APRC proposal proposed by the chairman of the committee Prof. Tissa Vitharana. Much work had been done and much consensus has been reached through these proposals. It is fundamental that there has to be an acceptable political resolution to the national question within the framework of an undivided indivisible Sri Lanka, if there is to be reconciliation and national integration. Regarding the development in the North and East Mr Sampanthan said, that the following areas could be identified as important sectors. Mr Sampanthan also urged that the private sector should be involved in such development with export promotion being actively encouraged. All other TNA members of Parliament from all districts also expressed their views and participated in the proceedings.